Who thought it would be such a hit?! – Making Memories in The Chaos. This week we’ve been doing a few play activities with a hidden intention of learning our colours for S and L. This particular one from yesterday was a BIG HIT, all 3 of the kids LOVED it and have been playing with it again today. 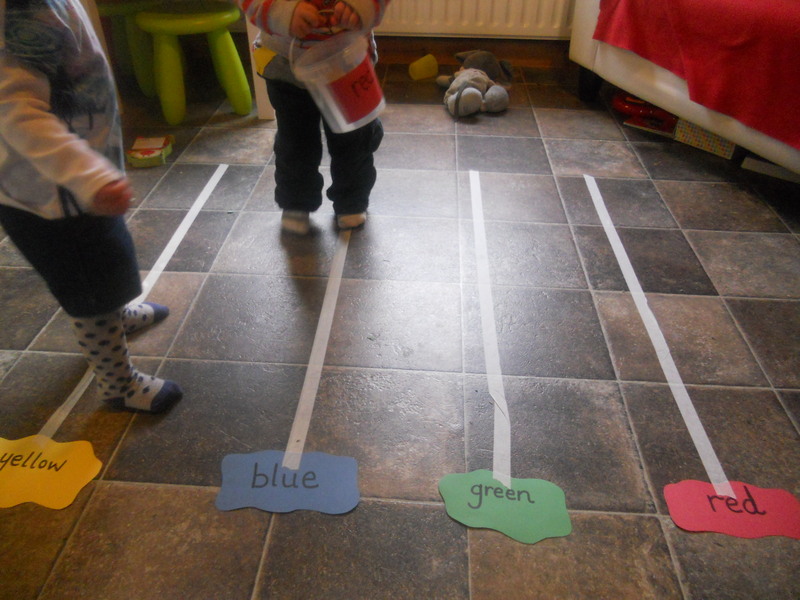 It was so simple but so effective and provided lots of opportunity to learn the colour names and identify them as there was so much repetition. 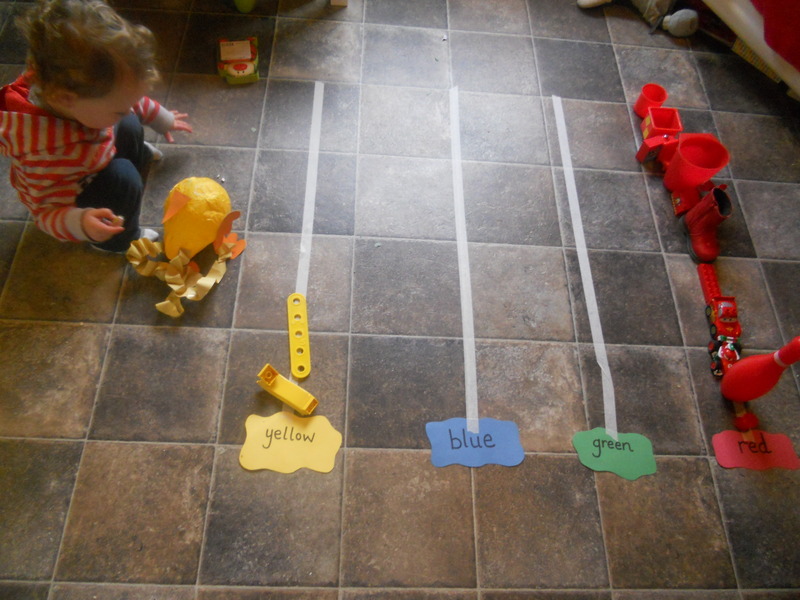 I simply stuck down some colour name labels, masking tape and made a VERY QUICK and super simple ‘treasure bucket’ and we were good to go! Honestly – mega simples!! I pointed out the name of each colour, got them to repeat the name (I know, I know, that is not really what you’re meant to do, BUT I have to confess I so do it, AND I think it works!) Anyway, after we named the colours, I modelled for them what they had to do. The first time, the bucket had a red label on it so we had to go find RED treasures all around the house!! I acted like a big dork, totally building it up to be mega fun and thankfully L and S totally bought into it! 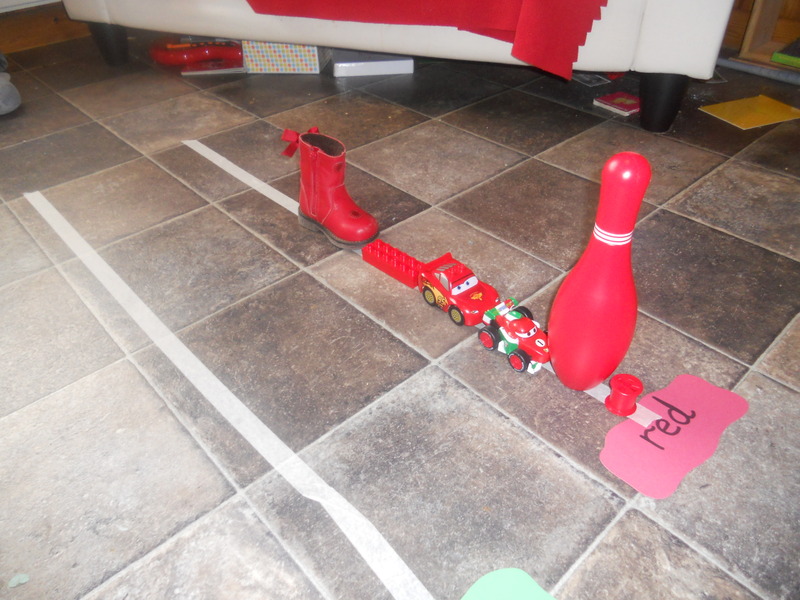 WE filled our bucket with red treasures, came back and put them onto the line! Then I explained we wanted to fill the line all the way to the top so they needed to go find some more! So, off they went. 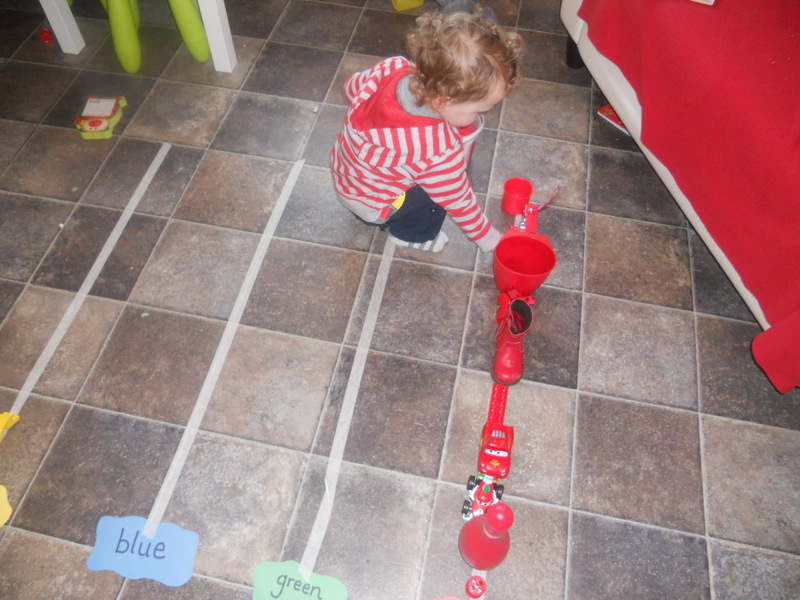 S (2 years 4 months) was able to find red toys and then line them up, L (1 year 4months) was not so good at filling her bucket with only red toys, but was able to sort them onto the correct line when she brought them back. When the red line was complete they moved onto another colour. They played with this for almost 2 hours straight – collecting toys, swapping for new ones etc…. and continued to play with it throughout the day. When J came home from pre school he was very interested in the new game and wanted to get stuck in straight away too 🙂 Wish I had remembered to take a photo when they had it completed! Next time I maybe won’t set it out RIGHT at the door of our kitchen!!! It was a great success – who would have thought something so simple could be such a hit?! But it really was. Give it a go at home, or even in your school or pre school! Your kids will be learning loads as they play. Let me know how it goes! Previous Post My name is Optimus, Optimus Prime! This is such a cool idea! I’ll definitely be trying it out when the little guy when he’s old enough. 🙂 Sometimes it’s the simple things that work best! 🙂 Hooray!!! Hope you’s have fun!! So often simple is the best! Looks like lots of fun! Totally agree – it’s the simple things that often bring the biggest smiles! Elsie’s favourite colour is orange (though i think that has more to do with the fruit). Good idea. Funny S has REALLY taken to eating oranges at the moment!! I’m scared he’ll get hives! That is great and looks fun! It really was a great activity! Although not so fun to tidy up!! What an awesome idea!! My kids will love this too. And, anything that will keep them entertained for 2 hours straight is a HUGE bonus!! I LOVE this! It almost makes me want to skip ahead two years or so to when my little guy could even remotely understand the concept – almost. For now I’ll enjoy the ease of putting him down in one spot and knowing he won’t run away 🙂 I’m looking forward to following your blog for more wonderful ideas like this!